Written by webb valarezo on Thursday, March 13th, 2014 at 9:37am. Assisted by a steady flow of drinks from one of the band member’s moms — How nice is that? — The Donkeys spent Friday night at the jam-packed Soda Bar proving that they are indeed the pride of San Diego. 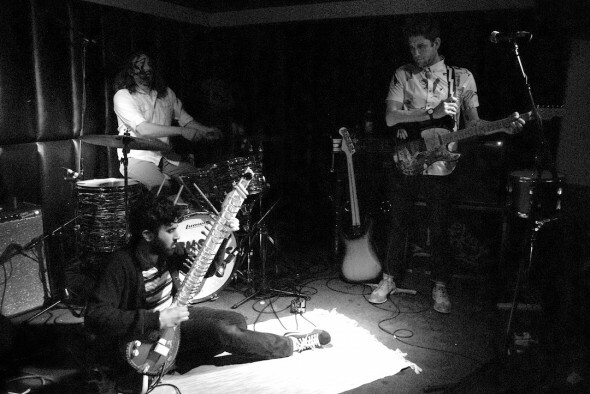 An eager crowd watched as band member Jessie Gulati sat on a rug (that really tied the room together) and tried to get his sitar to work. After a few awkward minutes of fiddling with plugs and exchanging nervous looks with the sound guy, the issues were resolved and The Donkeys opened their set with the sitar-heavy, instrumental track “West Coast Raga”. Following some hearty applause for the Ravi Shankar-inspired jam, the local group proceeded to play most of its album Born with Stripes. With their youthful energy and laidback enthusiasm, The Donkeys’ sound and stage presence perfectly captured some of the better aspects of our fair city. The band’s songs ranged from expansive summertime in the ’70s-style rock and roll to ’60s hippie pop and a few places in between, but it always kept the vibe unmistakably Southern Californian. The set was a lot of fun and The Donkeys sounded great as always. The real surprise of the evening came by way of the fantastic, newly formed openers Awahnichi. The trio started its set with such a full sound that it was difficult to pin down the genre. But as the set progressed and the dense wall of sound revealed itself to be something primal and hypnotic, it was hard not to be moved by the spirit of the music. With lyrics deeply rooted in Native American culture and a dynamic sound that is at once heavy and serene, Awahnichi’s music is of the incredibly ambitious, genre-bending type that we just don’t hear enough of.